Why the Ava DuVernay Barbie is a milestone for the brand—and for America. The Selma director gets Barbie-fied. Barbie’s tech gadgets have kept more or less up with the times—last year, Entrepreneur Barbie got in on that #startuplife with a tablet and iPhone—but her looks and her charmed, pink-hued lifestyle haven’t changed much since she first stepped out of her box in 1959. This holiday season, Mattel has shaken up its marketing strategy with a slew of buzzy new plans for America’s favorite ill-proportioned doll. Maybe heightened debates over gendered toys (hey there, GoldieBlox) have sharpened the company’s awareness of open niches in toy culture. Mattel cast a little boy in its commercial for the high-priced, high-fashion Moschino Barbie this year, effectively doubling its target market and earning hearty cheers from the feminist peanut gallery. Its other big commercial of the season focuses more on little girls’ career ambitions than the dolls themselves. The new artificially intelligent, exceedingly hackable Hello Barbie is made to give screen-obsessed kids a reason to put down mommy’s smartphone. And today, the company’s released a doll modeled after groundbreaking film director Ava DuVernay. The Barbie was never meant to go up for general sale—it started as a one-of-a-kind piece made to honor the director and five other celebrity women at Variety’s Power of Women luncheon in April. 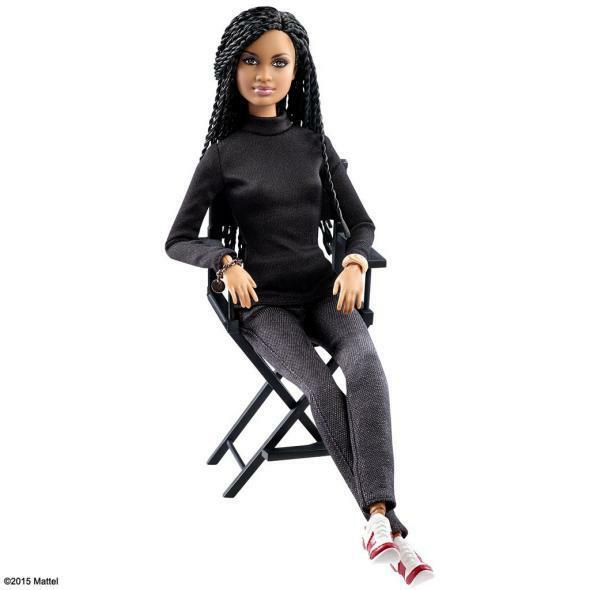 But after hordes of the Selma director’s fans registered their desire for a DuVernay Barbie of their own, Mattel decided to mass produce the thing. DuVernay’s Barbie doppelgänger is also one of the few African-American dolls out there with hair twists, too; the vast majority of black Barbie dolls have the same kind of long, silky-straight hair as white Barbies. Last week, Lenny published an interview with Natural Girls United’s Karen Byrd, who modifies Barbies of color with handmade natural hair styles. “There is a serious need for our young girls to be able to have dolls that look like them,” Byrd said. “It is something that affects their self-esteem, confidence, and how they view themselves.” DuVernay will donate her proceeds from the doll to black-run advocacy organization ColorOfChange.org and Witness, a nonprofit that trains activists to film human rights violations. A recent NPR story chronicled Barbie’s evolution from a mallrat who makes Ken’s sandwiches to an independent career woman for whom Ken is a mere accessory, arguing that while Barbie has been slow to change with American society, she’s making some kind of progress after all. If Barbie is an echo of shifting cultural views of women, a Barbie who can be a political, outspoken black film director with a recognizably African-American hairstyle is a landmark for both the doll and the market that demanded it.